Wondering what to plant this June? What will you be planting this summer? Discover some beneficial insects in your garden. The folks at the University of California Integrated Pest Management Program (IPM) have created a handy poster featuring some of our best insect friends–the natural enemies of garden pests. Except for it being a little breezy, we finally had some good weather on our scheduled workday – and we took advantage of it. It’s starting to look a lot like a garden. All of the beds have been constructed, and all of the beds in the initial section have been staked out, leveled and mulched. The five beds in the expansion area were set in place but will still need to be staked and mulched. Importantly, we did manage to clear out all the lumber and mulch that were taking up valuable parking spaces. Now we can dump soil into those parking spaces instead. * child-friendly activity TBD – If you have suggestions, please let me know. * serve lunch – If you would like to help with lunch, please contact Julie. We had originally planned to have the beds ready for soil this weekend, but the rains and other conflicts put us off schedule. If we can get all of the beds done this weekend, we will order the soil next week. Weather for Saturday looks OK right now. Bring your mulch forks, wheelbarrows, mallets, gloves, hats and insect spray. Friday morning I ventured inside the beltway to visit another community garden. Braes Interfaith Ministries is a ministry of Protestant, Catholic and Jewish congregations. They’ve been around for more than 25 years and provide clothing, food and financial assistance to over 16,000 people annually in southwest Houston. The Braes Interfaith Ministries Community Garden is sited on a CenterPoint easement, which makes it particularly interesting to us. I was fortunate to meet with Eloy Montez, the Executive Director. He talked about the garden and shared some advice about working with CenterPoint. Their garden was established over 20 years ago, when Houston Lighting & Power first gave them permission to garden on the easement. They have had to make concessions now that CenterPoint owns the easement, but their donation garden is still providing nutritious food for the poor in their community. There are a couple of significant differences in their arrangement and ours. 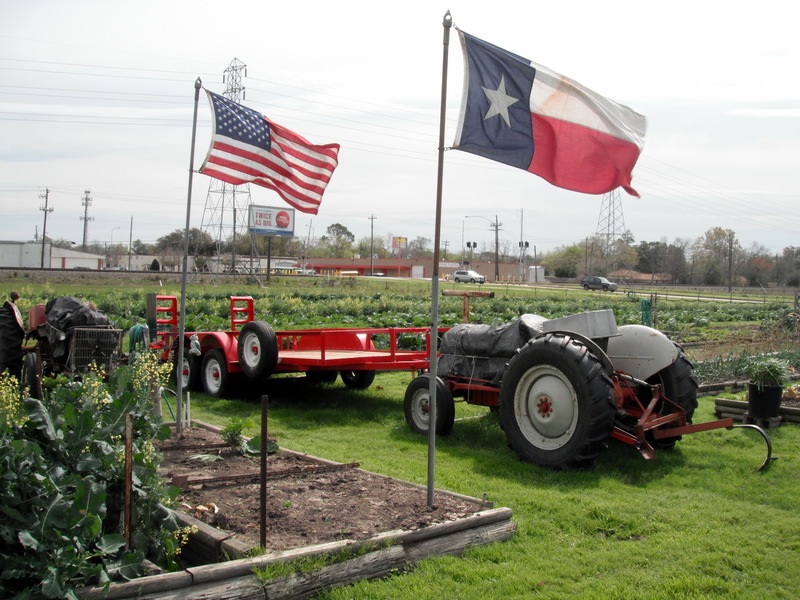 (1) CenterPoint is the fee owner of the property where the Braes Interfaith garden is located. In our case, BAUUC is the fee owner of the property, but CenterPoint has easement rights for the transmission lines. (2) The Braes garden is built up very near to the tower structures, but none of the garden elements are directly under the lines. The BAUUC garden maintains a requisite clearance from the tower and guyline structures, but our garden beds are under the lines. Well the garden now looks a good bit different than it did last Friday. 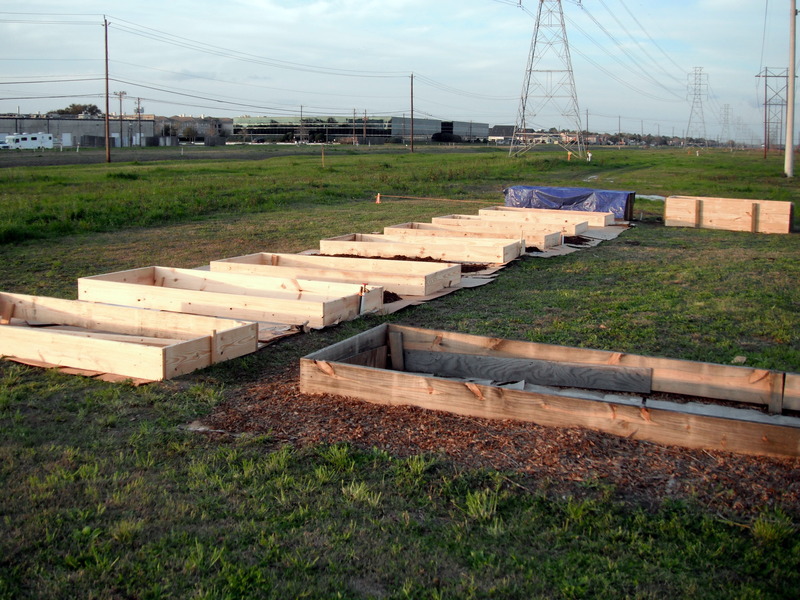 All of the 4×10 beds have been constructed (including the two extra-deep beds), nesting boxes for wrens have been built and hung around the property, and more seeds were started. THANK YOU EVERYONE! There’s still more to do, but it was a good weekend. Details and photos after the break. We decided not to do much work in this morning’s storm, so we’re going to try again tomorrow. 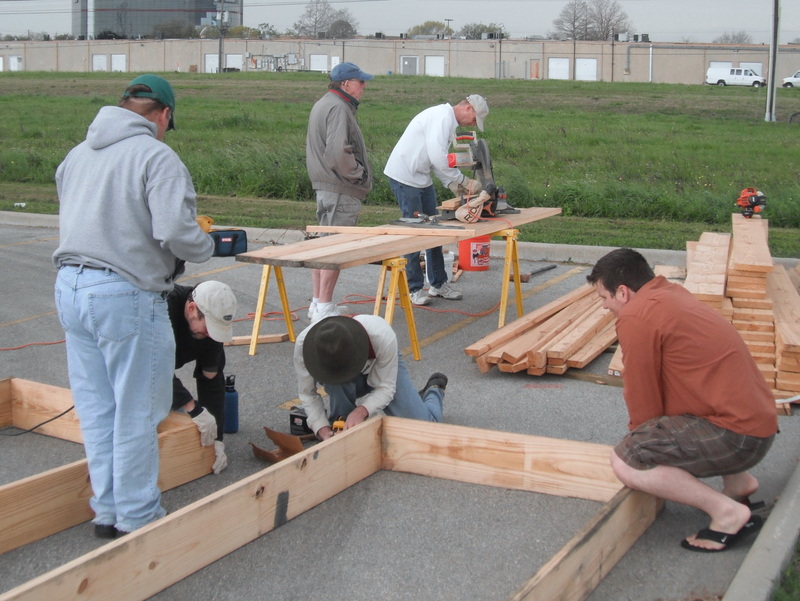 Meet in the garden (or Fellowship Hall) after 12:30pm on Sunday, February 19th for our next try to get the beds built. Thank you to all who came out today, and thank you to all who wanted to come but chose to stay safe.